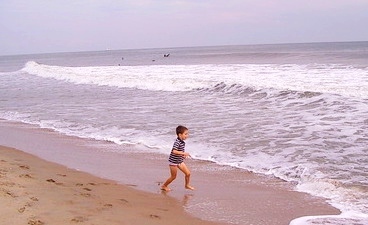 Looking for the best things to do on a rainy day in Virginia Beach? Has snow or ice thrown a wrench into your plans? Going crazy with another snow day stuck with the kids? Or is the heat driving you inside? I mean, you can only binge-watch so many TV shows or complete so many coloring books before going stir crazy! So embrace the weather and check out these rainy (or snowy or hot) day activities. You might have so much fun you'll look back and thank the weatherman. This museum is more than just a "walk through and look at me" museum, it has a heavy focus on hands-on activities and art classes. Admission ranges from $6-$8 (kids 4 and under are free) and includes a free audio tour. 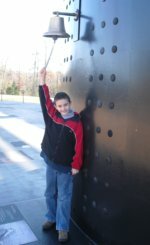 Ringing the bell at a recreation of the USS Monitor at the Mariners Museum. They offer a $2 discount for AAA members, and free admission (Labor Day through Memorial Day) to Blue Star families. You can find them at virginiamoca.org. This is a world-class museum in Norfolk with a great collection of European art (paintings, drawings, decor and one of the best collections of Tiffany glass I've seen outside of New York), plus something which really sets it apart: it's blown-glass collection and hot glass studio. Once you're done getting some culture, head on over to Baker's Crust or Doumar's Drive-In (a 50's drive-in diner whose owners invented the ice cream cone) for a bite to eat. Or, make a visit to nearby Nauticus and the Hampton Roads Naval Museum for some nautical, hands-on fun. Combine a world-class aquarium experience (rooms and rooms of displays from different parts of the world, include a two-story high tank), touch tanks, 3D movies, a zipline adventure, over 300 exhibits, lots of buttons to push, and a nature trail, and you have a place that will keep you busy for hours. My personal favorite aquarium is the Atlanta Aquarium, but this comes in a close second. Yes, it's a nautical museum, but it's so much more with a heavy emphasis on civil war history, a special Titanic exhibit, several interactive movies (including a 360 degree movie experience on the Battle of the Ironclads), and lots of hands-on displays, plus a life-size replica (and the real turret) of the famous USS Monitor. 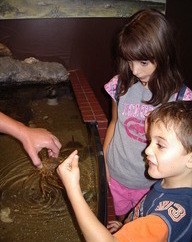 Touch-tank fun at the Virginia Living Museum. Located in Newport News (about 30 minutes from the beachfront) this museum/zoo/planeterium boasts lots of hands-on activites (including touch tanks) and sensory center. They also have a boardwalk/nature trail if you're willing to head outside to see animals like wolves, foxes and birds in their native habitat. Lousy outdoor weather calls for a little retail therapy, and luckily, hitting the shops is one of the easiest things to do on a rainy day in Virginia Beach since the area has so many shopping opportunities to choose from. You can start with little shops along the Boardwalk (which are usually crammed full of tourists on nice days or during the high season), or branch out and go to Lynnhaven or MacArthur Mall. My overview of Virginia beach shopping lists a number of great shopping destinations nearby, as well as details of the Williamsburg outlets (about an hour drive from the beach area) which just might encourage you to make a road trip. And if it's deep, deep bargains you love, check out my favorite Virginia Beach area thrift stores. Watch a movie - cheap! Sure, watching movies indoors may seem like obvious things to do on a rainy day in Virginia Beach. But if you can do it for just a few bucks, you'll feel like scooped a great deal while doing it. One of the best options is Cinema Cafe, which runs several locations in the greater Virginia Beach area and you can watch a current flick for as little as a buck or two-- plus enjoy yummy food while you watch. The Chesapeake and Pembroke Meadows locations are the cheapest, so it may be worth the drive, plus all locations offer deals on Tuesdays and Wednesdays. Yes, being outside on a cold beach seems seems counter-intuitive to a page entitled "things to do on a rainy day in Virginia Beach" (particularly if it's really cold), but hear me out. Fact: You'll have the beach totally to yourself. Fact: Snow on the beach makes for really cool selfies! Fact: Stormy seas make amazing photos. 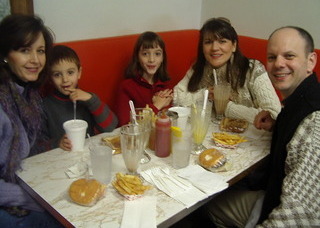 When you're done, warm up by stopping in for a meal or snack at one of the many restaurants along the boardwalk. Or, pop in to the Old Coast Guard Station (located at 24th Street and Boardwalk). This 1903 life-saving station has thousands of artifacts and photos and often has local artisans showing their work (last time I was there they had a gentleman demonstrating how to carve wooden birds). Admission is only a few bucks (kids 6 and under are free). Go to their website (oldcoastguardstation.com) to download a free coast guard fun page to keep the kids busy). You know that abandoned house or attraction you've passed by time and again and thought, "Wow, I wondered what that place looks like inside?" Now might be the time to consider it. Your explorations might even lead you to take a road trip to a museum in Richmond or Williamsburg. What ever you do, go out, defy the weather, pick one of these things to do on a rainy day in Virginia Beach and make it a great day!